This stereo power amplifier convinces with its inner values: music lovers are raving about the excellent sound quality of our Stamp. And with its compact dimensions it astonishes the audiophile world. Instead of another power amp behemoth, we present to you this more than serious amplifier which can stand its ground everywhere despite – or just because of – its size. Even if you’re the owner of small, trendy loudspeakers or listen to music over your second sound system, you may expect a lush and uniquely pure sound. The Stamp will allow you to do just this without pushing itself visually or soundwise into the limelight. "The Stamp I can recommend wholeheartedly. As long as you are realistic with room/speaker matching it offers true hi-ﬁ sound." 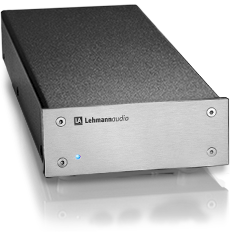 Like all our devices, the Stamp will leave Lehmannaudio with first-class components which produce a uniquely faithful and fascinating sound. Among others, we use components from Nippon Chemicon, BC Components and Epcos. To guarantee a low-loss current delivery capability, we apply a 105 µm copper layer on either side of the double-sided pc board. The internal audio wiring is fully solid-core. It is directly soldered to the sockets and the pc board to avoid additional plug-in connections. The oversized, linear power suppy is fed by a magnetically and statically shielded toroidal mains transformer. Measuring only 280 x 115 x 42 mm the Stamp delivers up to 2 x 20 W into 4 ohms. Loudspeakers with a sensitivity greater than 87 dB/1 W turn out to be perfect matches. Setup of this refreshingly different power amplifier is a snap: thanks to its modest size, you can put it right next to your chain. Using the optional mounting kit you can also attach it quite easily wherever it fits best for you – e.g. under your desktop or on a wall. By the way, if your speakers have bi-amping terminals, you can reconfigure the Stamp in a breath. For bi-amping operation you’ll need two Stamp power amps. When combined with our Linear, you’ll get a puristic pre/power amp combination that is going to thrill you. The Stamp is available with two face plate finishes. The impressing technical details of the Stamp.